Senator Jeff Flake Turns To 'Conscience' In Book Criticizing Trump And Fellow Re The GOP has "given in to the politics of anger—the belief that riling up the base can make up for failed attempts to broaden the electorate," the senator says. "These are the spasms of a dying party." Sen. Jeff Flake, R-Ariz., wrote a new book, in secret, criticizing President Trump and Republicans who have not stood up to him in defense of conservative values. 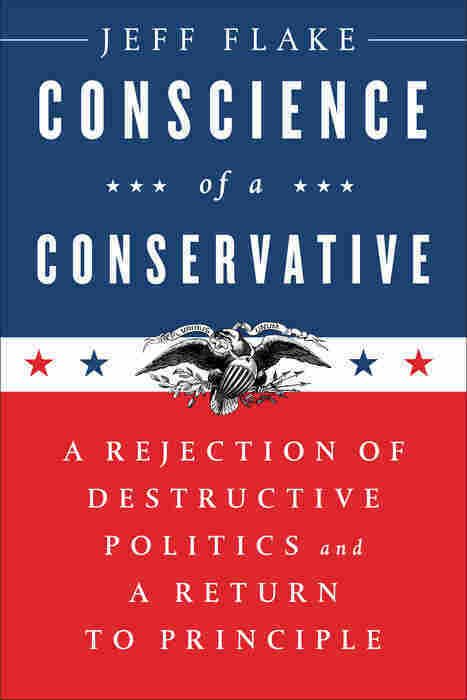 Arizona Sen. Jeff Flake wrote his new book Conscience of a Conservative: A Rejection of Destructive Politics and a Return to Principle in secret, not even telling his closest political advisers about his plans until it was ready. And given the political test he'll face over the coming year, it isn't hard to see why. Flake is up for re-election in 2018, where he faces real threats from both the left and the right. His book is inspired by former Arizona Sen. Barry Goldwater's 1960 tome of the same name and is direct in its criticisms not just of President Trump, but toward other Republicans for, as Flake sees it, turning a blind eye and making a "Faustian bargain" when Trump abandoned many core conservative principles like free trade, and for his controversial stands, from birtherism to racial dog whistles. While the things he lays out in his book may well endear him to independents and even Democrats in Arizona, the radical way he takes on Trump without abandon certainly won't help him in his first test next year: a GOP primary where challengers — who are being egged on by the White House — are already circling. Near the end of the 2016 election, seeing major GOP figures criticize the party's nominee was nothing out of the ordinary. Many — including Flake — refused to vote for Trump and further craved distance after his vulgar 2005 Access Hollywood tape surfaced. But come November, against all odds, Trump rode a populist wave to victory, giving Republicans control of the White House, Congress and selection of a new Supreme Court justice to boot. With unified control of Washington, criticizing the new president suddenly waned in GOP circles. Now, as Trump continues to stumble after 200 days in office, Flake writes that their relative successes shouldn't matter: "I write this book because we as conservatives — and conservatism itself — are in crisis." Flake admits that may seem like "a preposterous claim," given that they control the government. "But make no mistake, as a governing philosophy, conservatism is indeed in crisis — and not in spite of this apparent success but because of it," later blasting self-described conservatives for changing their political stripes "depending on fashion or the passions of the day or based on how much applause a line in a speech received at a rally." Trump's theory to win in 2016 was to draw out white, working-class voters who hadn't shown up for Republicans in years, but he failed to broaden the electorate by targeting younger and more racially diverse voters as the GOP's 2012 autopsy recommended. Flake says that strategy was only a Band-Aid, giving in to the "sugar high of populism, nativism, and demagoguery. The crash from this sugar high will be particularly unpleasant." "We have given in to the politics of anger — the belief that riling up the base can make up for failed attempts to broaden the electorate," Flake writes. "These are the spasms of a dying party." Flake argues throughout that just because Republicans notched an unlikely win last November, they shouldn't take that as a mandate or a signal that the type of politics Trump and his disciples preach should become the conservative gospel. In fact, he makes clear he believes many of their populist pitches are downright heretical. Trump spent the entire 2016 campaign assailing free trade, appealing to Rust Belt workers hit hard by declines in manufacturing jobs that he argued were the result of bad trade deals, but in reality were more of a result of technological advances. Abandoning a core economic principle of the conservative movement and the Republican Party for generations, when Trump got into office he withdrew the U.S. from the Trans-Pacific Partnership, and soon his administration will begin renegotiation of the North American Free Trade Agreement. A good portion of the book is spent outlining why Flake believes free trade is so critical to a healthy U.S. economy and why it's been the backbone of conservative economics. He calls Trump flat-out wrong for opposing it and criticizes other Republicans for not pushing back more. "Rather than fighting the populist wave that threatened to engulf us, rather than defending the enduring principles that were consonant with everything that we knew and had believed in, we pretended that the emperor wasn't naked," he writes. "Even worse: We checked our critical faculties at the door and pretended that the emperor was making sense." "Never has a party so quickly or easily abandoned its core principles as my party did in the course of the 2016 campaign....lurch[ing] like a tranquilized elephant from a broad consensus on economic philosophy and free trade that had held for generations to an incoherent and often untrue mash of back-of-the-envelope populist slogans. Seemingly overnight," Flake laments, blaming "powerful nativist impulses that have arisen in the face of fear and insecurity over the swiftly evolving global economy." Flake, a border state Republican, is also at odds with Trump — and many within his own party — on the issue of immigration. "We have to return to the politics of comity and inclusion and reject the politics of xenophobia and demonization," writes the former member of the Gang of Eight, the bipartisan group that pushed a comprehensive immigration reform bill through the Senate in 2013, only to see it die in the House. We have given in to the politics of anger — the belief that riling up the base can make up for failed attempts to broaden the electorate... These are the spasms of a dying party. Flake opens up about why he's so sympathetic to the plight of immigrants, and it's not just because of the large Hispanic population of the state he represents. There are humanizing elements and personal reflections throughout that give a glimpse into how his upbringing and faith have shaped his conservative worldview. The son of a rancher who depended on migrant labor, Flake talks about how he got "to know immigrants intimately and honestly. You learn through experience how indispensable they are to making things work in America." And the "nativist impulse" that crescendoed throughout 2016 is "always destructive, always comes with a cost, and never ends well." As a devout Mormon, Flake also recalled the plight of his own forefathers, recalling how in 1838 the Missouri governor signed an order saying that the religious group "must be exterminated or driven from the state if necessary." And he talks about how it was a group of Muslim immigrant doctors who saved his father-in-law's life after he suffered a massive heart attack. "When we say 'No Muslims,' or 'No Mexicans,' we may as well say 'No Mormons,'" Flake writes. "Because it is no different." 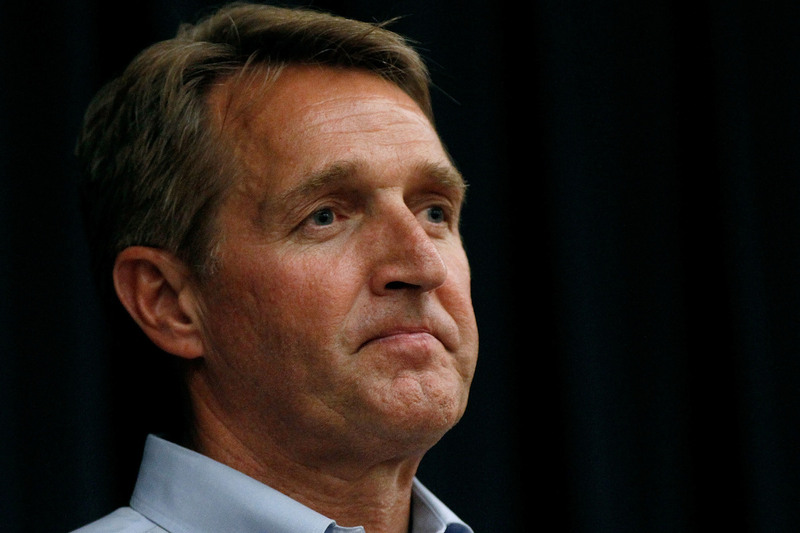 Flake immediately denounced Trump's proposed Muslim ban when he unveiled it on the campaign trail in December 2015, and even visited a mosque shortly after to show his support. For that action, he received a note of support and thanks from former President George W. Bush — who had visited a mosque in the wake of the Sept. 11, 2001, terrorist attacks to try to temper anti-Muslim sentiments. Now that he's president, Trump has tried to push through another ban on immigration from six, originally seven, Muslim-majority countries, which has been logjammed in the courts and will eventually be ruled on by the Supreme Court this fall. Flake concedes that any president does have broad latitude over national security matters, and likely the order was within Trump's rights, as he and his advisers have argued. But the Arizona senator rebuts that "there is a world of difference between believing you can do something and that you should do something." There has been a marked decline in illegal border crossings under Trump and then-Department of Homeland Security Secretary John Kelly, now the president's new chief of staff. Flake is also deeply troubled by the lines of demarcation drawn between parties, and how even helping or working with — or, heaven forbid, saying nice things about — someone from the dreaded "other side" is interpreted as partisan treason. In one poignant anecdote, he recalls how he sat with his Arizona colleague, former Democratic Rep. Gabrielle Giffords, as she attended the State of the Union one year after she was nearly assassinated during a constituent event. Still recovering from a debilitating brain injury, she wanted to stand to applaud President Barack Obama but couldn't do it on her own. So Flake helped her rise, leaving him as "a lone Republican among cheering Democrats." That gesture prompted him to receive "furious text messages and emails" from constituents demanding to know why he "agreed with President Obama." Similarly, when he dared to send out a supportive tweet about Virginia Sen. Tim Kaine after he had been chosen as Democratic nominee Hillary Clinton's running mate last year, calling him a "good man and a good friend," Flake felt "remarkable, unhinged fury from the ideologues" in return. By that time, Flake had already made his concerns with Trump well-known, and the then-GOP nominee even told him when he came to Capitol Hill to meet with senators that Flake would lose his election in November; Flake wasn't up until the following cycle, however. "I am a proud conservative and a lifelong Republican. That does not make the Democrats my enemies. America has too many real enemies to indulge such nonsense," Flake writes. For Flake, that extends to the press as well, which Trump and his advisers have frequently branded the "opposition party." He's deeply troubled by the spread of "fake news" and conspiracy theories — but not in the way Trump throws around the term to be a catch-all for any mainstream media story he dislikes. Calling it "madness to turn ourselves inside out in an attempt to make reality comport with an alternate reality, just because someone in power would like us to," Flake says such attacks on the truth itself, and questioning what are facts in favor of "alternative facts," are "a threat to democracy" and certainly not becoming of any conservative principles. It's something he's faced blowback for back home when he took the fact-based position that yes, Obama had been born in the U.S. He calls out Fox News and other conservative sites for continuing to promulgate the myth. He recalls being jeered at a Tea Party event when he said he did believe President Obama was a citizen, saying that "to be booed because I didn't subscribe to a right-wing conspiracist fantasy about our first African American president is a sobering experience indeed." "When a conspiracy theory becomes litmus-test orthodoxy, objective reality is at risk," Flake bemoans. Something else that could be at risk is Flake's own political future. Trump has reportedly talked about spending as much as $10 million to defeat Flake in a primary, and last week the White House wouldn't confirm or deny whether the president would support a challenger to Flake. Press secretary Sarah Huckabee Sanders did say that Flake "would serve his constituents much better if he was less focused on writing a book and attacking the president" and zeroed in on "passing legislation" instead. But Flake has, in fact, backed most of Trump's appointees and political agenda so far, even voting for the failed Senate GOP health care bill even as it was Arizona's other senator — another frequent Trump critic John McCain— whose "no" vote torpedoed it. And while Flake's 136-page manifesto pulls no punches, in some of the interviews he's done after the book came out he hasn't been as pugnacious in going after the president, as he was on NBC's Meet the Press this past weekend, perhaps denying ad-makers of damaging clips. For now, though, Flake's marker against the president and those in his party he brands as conservative sellouts is the biggest indication yet of how Trump — part unwilling, part unable — has failed to unite the GOP, exposing the large fissures that still remain despite Republican sweeps last November. As Republicans head into 2018 and beyond, Flake says he is trying to save the party from themselves. "This is not an act of apostasy. This is an act of fidelity," Flake writes as his conclusion. However, the Arizona senator also risks making this book his swan song. Whether other Republicans follow — or whether Flake himself is even around in 18 months — will show whether he was among the first in his party to take on the president successfully or the first casualty of President Trump's penchant for political payback. An earlier version of this story incorrectly stated that an order by the governor of Missouri expelling Mormons from the state was signed in 1938. It was signed in 1838. Also, the Sept. 11 terrorist attacks took place in 2001, not 2011.